At Mint Creative we’re committed to protecting and respecting your privacy. • If you apply for a job with us. It also describes how we use your data, the conditions under which we may disclose it to others and how we keep it secure. Mint Creative Ltd are a creative design agency who offer design, print and web services. 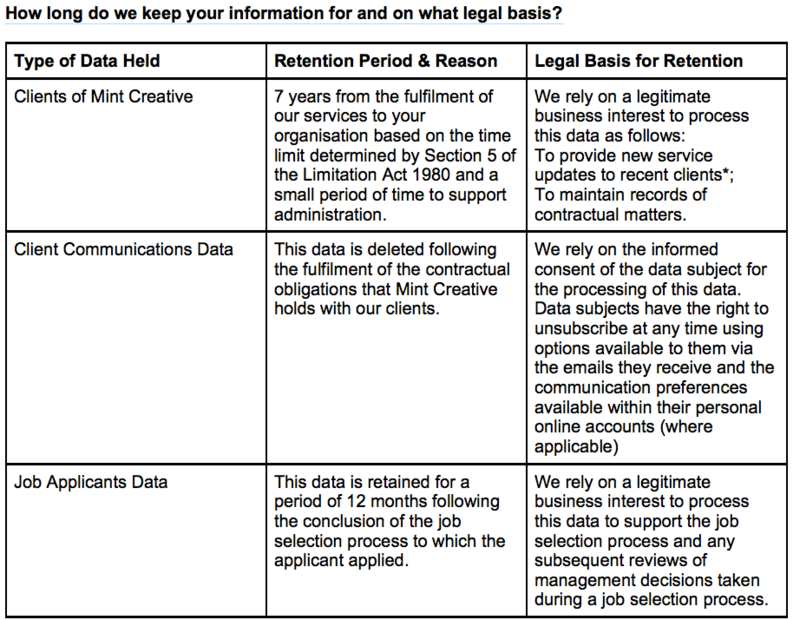 Any questions regarding this Policy and our privacy practices or if you wish to exercise any of your rights under Data Protection legislation in the you UK you can contact us either in writing to Mint Creative Ltd, 7a St Georges Place, Brighton, BN1 4GA or by email at dataprotection@mintcreative.com. We obtain information about you when you use our website, for example, when you complete the contact form, when you sign up for our newsletter or engage with other forms within our site, or directly from you when you contact us through any other means to enquire about our services or become a client of ours. When we work with our clients we maintain a basic set of information, i.e. Name, company name, contact and invoicing addresses, email addresses, telephone number and details of the services that you engage with us. As a company that provides communication services we often process data relating to individuals that have consented to receiving information on goods or services that are of potential interest to them. The personal data that we process includes names, addresses, email addresses, profiles and preferences in relation to the goods or services that are of interest and purchase histories. The data we process from job applicants includes name, address, telephone numbers, email addresses, career history, references and other details that may be included in CVs. We will only process health related data if this data is provided to us by a job applicant. How long do we keep your information for and on what legal basis? * Note that we will always provide an easy option to unsubscribe from any communications that you might receive from us concerning our products and services. See ‘Your Choices’ below for further information. Third-Party Service Providers working on our behalf: we may pass your information to our third-party service providers, agents, subcontractors and other associated organisations for the purposes of completing tasks and providing services to you on our behalf (for example, to process donations, provide print services and send out mailings on your behalf). However, when we use third-party service providers, we disclose only the personal information that is necessary to deliver the service and we have a contract in place that requires them to keep your information secure, to not to use it for their own direct marketing purposes and to delete it following the fulfilment of their services to us. Please be reassured that we will not release your information to third parties beyond the company for them to use for their own direct marketing purposes, unless you have requested us to do so, or we are required to do so by law, for example, by a court order or for the purposes of prevention of fraud or other crime. You have a choice about whether or not you wish to receive information from us. We will not contact you for marketing purposes by email, phone or text message unless you have given your prior consent. We will not contact you for marketing purposes by post if you have indicated that you do not wish to be contacted. You can change your marketing preferences at any time by contacting us at the address provided in the ‘How To Contact Us’ section above or by clicking ‘unsubscribe’ at the bottom of all of our email marketing communications. The accuracy of your information is important to us. You have the right to request a copy of the information we hold about you so that you can ensure its accuracy. You can do this by sending an email or writing to us at the address provided in the ‘How To Contact Us’ section above. You have the right to request for us to erase any data we hold on you. You can do this by sending an email or writing to us at the address provided in the ‘How To Contact Us’ section above. All our employees and any third-parties we engage to process your personal information are obliged to respect the confidentiality of your information. However, the transmission of information via the internet is not completely secure. Although we will do our best to try and protect your information, we cannot guarantee the security of your information transmitted to our website; any transmission is at your own risk. Our marketing databases, cloud document storage, email systems and this website are all administered centrally but may be hosted by third-party providers. Details of these providers and of the various security measures Inspiring People HR uses to protect your information and employee information are available upon request.